tl;dr: More than just making it easier to line up your engine components, starting with a larger handsize increases the hard limit on the number of stop cards you can have in your deck before you dip below a 100% chance to draw your deck. Use this to your advantage when you decide on whether to add stop cards to your deck. 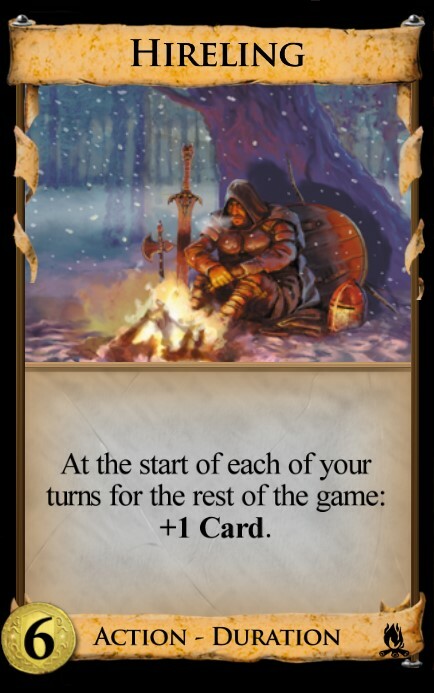 In this article, I'm going to be sharing some thoughts on the worth of pursuing duration cards that draw at the start of your turn. Having a larger starting handsize improves your deck's reliability by making it more likely that you start off with a combination of cards that will help you really kick off your turn. But, the benefits of duration draw go further than that. Duration draw also lets you flat out do more with your deck, and I'll be explaining what I mean by that. I'm going to define a couple terms here for clarity that apply specifically to the context of this article. A "stop card" is any card that doesn't draw a card from your deck, and includes Throne Room variants. For simplicity, this article considers actions a non-issue, so Smithy is not a stop card. One's "stop card capacity" (SCC) is the number of stop cards your entire deck can contain before you risk not drawing your entire deck in a turn*. You start the game with a starting handsize of 5 and a SCC of 4. You also start the game with 10 stop cards, so realistically you will never get your stop card count within your SCC without deck thinning. A simple example of when you should be mindful of SCC is in a Bishop/Fortress infinite VP game. With an SCC of 4, you can have up to 4 Bishops (which are stop card) in your deck and still be guaranteed to draw and play them all. The moment you add a 5th Bishop, you run the risk of having a starting hand of all Bishops with no Fortresses to trash. If you and your opponent's VP were equal up to this point, then this dud is pretty much game losing. But duration draw changes this math, in a way that pure trashing and pure draw cannot, by increasing your starting hand size and hence your SCC. Now imagine you have the same deck, but you have two Caravans that you alternate playing each turn, or you have a Hireling in play. Now you have a starting hand of 6, and an SCC of 5. Hence, you can now gain a 5th Bishop and still be guaranteed to play all 5 Bishops, eventually overtaking the VP count of a player that can only support playing 4 Bishops a turn. So we see here that duration draw is more than just a reliability boost. It is actually a boost to the maximum potential of your deck because it allows you to include more stop cards in your deck before you have a chance to no longer draw your entire deck. Even if you have 10 Labs or 10 Smithies with the +1 Action token, so long as you have at least 5 stop cards, you might end up having a starting hand of all 5 of them if you are at the top of your shuffle, unlikely though this may be. The likelihood of such a dud of course increases the more stop cards you add relative to the size of your whole deck and SCC. Some duration duration draw cards are stop cards the turn they are played, but still result in a net increase in SCC if one copy is played each turn. Examples of these cards are Enchantress, Den of Sin, and Haunted Woods. Enchantress and Den of Sin are stop cards when played, but give you a starting handsize of 7 and an SCC of 6. So you add 1 stop card but increase SCC by 2, allowing you to add an additional stop card to your deck before risking a dud turn. Haunted Woods gives a starting handsize of 8 and a net increase of SCC by 2. Some duration draw cards are more peculiar in how they influence SCC. 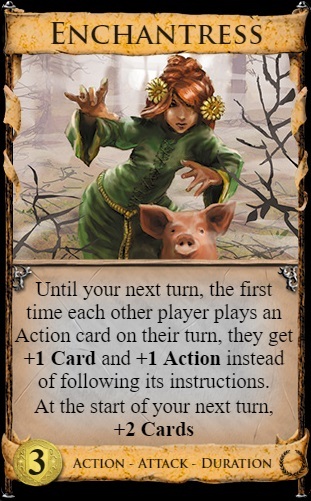 Haven increases it by one next turn at the cost of a card this turn, but you won't reduce your SCC this turn so long as you do not set aside a card that is necessary to draw your deck (e.g. setting aside a cantrip in a deck of only cantrips and stops cards), with stop cards being safe to set aside if the goal is to see all your cards. Even more interesting is the Dungeon duration effect, which if received at the top of your shuffle, can still allow you to see all your non-stop cards before your stops cards if your total number of stops cards minus the number of stop cards you discard to Dungeon is within your SCC (e.g. having 6 or less stop cards and then discarding two will let you see all your non-stop cards with a starting handsize of 5 and SCC of 4), and then you can still draw deck if those non-stop cards all together can raise your handsize to the number of stop cards in deck (e.g. you have Laboratory). And then there's Wharf, which isn't even a stop card the turn you play it and thus having the same net effect on SCC as Haunted Woods. By this measure, Wharf is busted strong. I'll make a special mention to some non-duration cards that increase SCC. Any card that can push draw cards to your next starting hand can increase SCC. This includes Scheme and topdecking cards like Count or Mandarin. Combining discard and draw can also seed your next starting hand with spare draw cards if your deck and discard are empty, for example discarding spare draw cards with Storeroom for coin then playing a single draw card. And of course the Expedition event increases starting handsize and thus SCC. Stop cards can have powerful effects that are really good at helping you win the game. Province/Colony, Gold/Platinum, Bridge, and Haggler are just a few examples of potentially important stop cards. If your stop card count is below your SCC, you can be more aggressive in gaining more without any fear of a dud. While games where players slowly drain Provinces are likely to have players eventually exceed their SCC, games where you gain a Province or two then pile out the next turn, or at least threaten to, may not. Knowing exactly how many stop cards you can support is something that should always be on your mind in games with strong deck thinning, and you should be aware that investing in duration draw increases the hard limit on how many you can support. *If the size of your deck is exactly equal to your starting hand size, then you still draw your deck even if all your cards are stop cards and by my definition you exceeded your stop card capacity by 1 in cases where your deck size is greater than your starting handsize. This matters particularly with Donate. Edit: expanded the section discussing specific duration cards and their effect on stop card capacity, and remove the "StC" acronym for "stop card". Edit 2: Expanded impact of duration draw section with explanation on dudding with regular draw and with examples of non-duration cards that increase stop card capacity. Also replaced mention of University in the bit about good stop cards with Haggler. Edit 3: removing confusing bits in the definition of stop cards. Some duration duration draw cards are StCs the turn they are played, but still result in a net increase in SCC if one copy is played each turn. Examples of these cards are Enchantress, Den of Sin, and Haunted Woods. Doesn't Wharf merit a mention here? I know you can't give an exhaustive list, but it's a pretty important card. And I found the StC abbreviation awkward and unnecessary. It's also a little confusing because you introduce a second, quite similar acronym. You could just use 'stop card' throughout, or even shorten it further to 'stops'. We know they are cards. The astute reader will notice that Wharf is actually not a stop card if actions are a non-issue. Yeah I was really just experimenting with the abbreviations. I wanted to make another post explaining that I want feedback for improvements. The similar between the acronyms is actually why I shied away from just "SC" that looks like a typo. "Stops" sounds good though. Right, because of the draw both turns. Ok, maybe explicitly point that out for those of us who are a bit slow. Yes, I will update the article later to add your suggestions. Really, the fact the Wharf is not only not a stop card, but actually increases your handsize while still having the same net effect on stop card capacity when alternated as alternated Haunted Woods should give an idea of how nuts Wharf is. This is a good topic to explore! I think it would be nice to add a section on how duration draw compares to regular draw, because as defined in the article, regular (terminal) draw is always superior to duration draw in terms of SCC (that is because you defined it not looking at actions). So some clarification would be helpful I imagine. 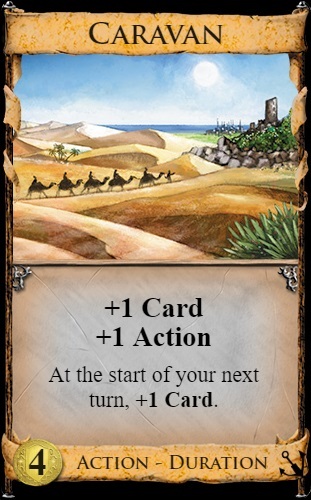 Another minor nitpick is the list of "potentially important stop cards". Why is University there? I get the basic cards references because well they are in every game, and Bridge is a good example of an explosive card, but Uni is neither particularly strong nor basic. Maybe the idea is to illustrate that even +actions can be stop cards? Then maybe it is better to explicitly state so, as otherwise newer players might be led to believe that Uni is on par with Bridge in terms of strength. Yeah it seems I need to clarify the difference between terminal draw and duration draw. Non-duration terminal draw does not influence SCC because, if you drew your deck last turm, then there is a chance you start your turn with 5 stop cards and have a complete dud before you find any of that draw, or that you see 5 stop cards before you find any handsize increasing draw. For example, you have 4 stop cards and a Market, and then the Market finds a 5th stop card before it finds a Lab. Yes in practice this is unlikely in most cases with a deck stuffed with draw, but it is still technically possible. With duration draw, the number of stop cards that would have to be in your starting hand to have a complete dud is higher. About mentioning University, well at that moment I was struggling to envision really good stop cards that happened to not be trashers, handsize reducers like Artisan, or attacks like Goons or Mountebank that alter to stop card capacity or the number of stop cards. Looking at my card ranking list, most of the stop cards that are considered powerhouses tend to be attacks or use up cards in hand in some way like Butcher and Count. In the scenarios I envision where stop card capacity is actually relevant, University is pretty powerful because of its gain and relevance for 3-pile endings and gain-and-play. Still, I can easily swap in Haggler in its place. And then there's Wharf, which isn't even a stop card the turn you play it and thus having the same net effect on SCC as Haunted Woods. By this measure, Wharf is busted strong. If I understand correctly, the terminal draw part of Wharf should not matter for SCC and thus it would not have the same net effect as Haunted Woods. What I mean there is that Wharf increases your starting hand to 7 with the other Wharf not being a stop card, while Haunted Woods increases it to 8 but with the other Haunted Woods being a stop card. Effectively, you can add two extra stop cards without fear of a dud whether you use Wharf for terminal draw or Haunted Woods. In this case, the dud with Wharf would require you do not find the Wharf in your 7 starting cards, but you can dud with Haunted Woods if the other one is one of your 8 starting cards. So by net effect, I mean how many extra stop cards you can add to your deck before you risk a starting hand of all stop cards. For a deck alternating two Wharves or two Haunted Woods, this number is 2. Edit: and for Ghost Town it would be zero if you are just alternating between two of them without buying more. People say how Ghost Town's handsize increase is offset by other Ghost Towns being stop cards. The definition of stop card capacity I give here is my attempt at quantifying that idea somehow. "A "stop card" is any card that doesn't draw a card from your deck and doesn't reduce your handsize when played, and includes Throne Room variants." Is this a typo? I think you mean "increase", otherwise e.g. treasures would not be considered stop cards. Ah, I meant to say "and does decrease handsize when played". I was thinking of cards like Oasis or but wanted to exclude cards like Wish. I'll reword this section. Is your SCC ever different from your handsize* minus one? If so, when? Are Dungeon and Warehouse stop cards? A "stop card" is any card that doesn't draw a card from your deck, and includes Throne Room variants. For simplicity, this article considers actions a non-issue, so Smithy is not a stop card. With an SCC of 4, you can have up to 4 Bishops (which are stop card) in your deck and still be guaranteed to draw and play them all. Hence, you can now gain a 5th Bishop and still be guaranteed to play all 5 Bishops, eventually overtaking the VP count of a player that can only support playing 4 Bishops a turn. And then there's Wharf, which isn't even a stop card the turn you play it and thus having the same net effect on SCC as Haunted Woods. Province/Colony, Gold/Platinum, Bridge, and Haggler are just a few examples of potentially important stop cards. Hm... Am I suddenly an idiot? It may look like it, because everyone seems to know what this is all about, yet I feel that I'm in way over my head, here. My IQ is pretty decent, so I should be able to understand this, but I'm really having a hard time getting my head wrapped around this. Maybe it's the language (I'm Norwegian), but I've had no problem understanding or even translating English in the past, even old literature. If you consider actions non-issues, why do you still state that several action cards are stop cards? There are even more references in your article to actions being stop cards (mainly Duration cards), and I thought they're not considered stop Cards? And how can you guarantee drawing and playing all your four Bishops, if they are the only stop cards in your deck (you've already stated that Smithy isn't a stop card, but a hand of Smithy and four Bishops may at best let you play one Bishop)? Interestingly enough, the stated stop card Throne Room will at least allow you to play two of those Bishops, but you still doesn't get to draw Your deck, nor play all the Bishops. I probably got my message across several sentences ago, but I wanted to list all the issues I had, in case I've just misunderstood some things, but not everything. Please advice, because I really want to understand this. Seems like really useful advice (and everything becomes much clearer) if you just remove the first quoted paragraph above, but I guess it's there for a reason. Probably the cleanest way to consider actions not an issue is to have Champion in play. Then you can play any number of Actions! Of course, this can also be approximated with sufficiently high standard Village density, since Villages don't increase or decrease handsize. One's "stop card capacity" (SCC) is the number of stop cards your entire deck can contain before you risk not drawing your entire deck in a turn*. So I have 2 Haunted Woods. I can draw 7 non-Haunted Woods stop cards each turn, and this will never cause duds. Okay, my SCC is 7. Now say I have 2 Wharves. If I add 7 non-Wharf stop cards, I could potentially start my turn with all those in hand and my other Wharf on top of my deck. Thus I have not drawn my entire deck. So clearly the SCC of 2 Wharves is less than 7. @faust: To play a duration card every turn, you need two of them in your deck. Haunted woods gives you a SCC of 7, but the other Haunted Woods is a stop card, so effectively you only have a SCC of 6. Wharf gives you a SCC of 6, and since the other Wharf is not a stop card, it doesn’t change this. @oyvind: he assumes infinite actions, and then a stop card is any card that doesn’t draw. SCC is one less than your starting hand, so as to guarantee that you draw your deck, not that you draw all your stop cards. Is that the confusion? Okay, so the idea is that I can add any number of cantrips and be guaranteed to play them all. Okay, that makes sense. But it would be good to clarify this in the article. Yeah I think this is a case of things making more sense in my head. Yes, you can play 7 stop cards and one Haunted Woods if you start the turn with Haunted Woods in play (and 8 cards in hand), but you won't be able to play all your Markets or other cantrips or whatever if you start your turn with 7 stop cards in hand. If you have only cantrips and stop cards, you also won't be able to play all your cantrips if your number of stop cards exactly equals your starting handsize and you don't have one of them on the bottom of the deck. You'd miss out on playing all the cantrips below your stop card that exceeds the stop card capacity (5th stop card in a starting hand of 5). I acknowledge that what I'm talking about in this article is a confusing concept and that I didn't add as much clarification as I could have in order to keep the article length down. I'll work on editing the article for further clarifications in the near future. I read this article a while back, and my main response was, "What's so special about 100% reliability?" I mean, reliability is great and all, and having more duration draw and fewer stop cards will certainly get you reliability. But the difference between 70% and 90% reliability is more important than the difference between 90% and 100%. If kicking off wins you games, then an increase of 20% will win you twice as many games as an increase in 10%. The situation where stop card capacity seems most important is when your draw is based mostly on cantrips. Say I have 10 peddlers and 4 stop cards, my reliability is 100%. But if I add a single stop card, suddenly my reliability is 33%. Yeah in practice what you care about is raw reliability increases. However, the math gets complicated when you want to compute exactly how much your chance of kicking off increases or decreases based on your actions. I wanted to focus on the most basic case of reliability drops, which would be when your chance of a "dud", or failure to draw deck, first goes above 0%. From there, you can go further and figure out more reliability comparisons, but that's a huge topic. I also wanted to call attention to cases where you have nothing to fear by adding more stop cards because your chance of dudding after adding them is still 0%. This is especially interesting in Wharf games where this means you can go straight for Provinces or more treasure instead of losing time to increase your draw. Basically, I wanted to raise awareness about "overbuilding" when it is not necessary in addition to being mindful about underbuilding. I should maybe talk about these overall implications and ideas in my conclusion. This a good article, well done. I think it's one of the more nebulous concepts to most players-- the difference between cards during your turn and cards at the start of your turn. I have two considerations for you. 1: You may want to make it clear at the beginning of the main section that your discussion is framed in the context of a game where both players are playing a deck that draws itself every turn and wins the game with stop-card payload. I understand why you frame it in that context-- it's the clearest, most illustrative example of the concept you're getting at. But everything you're saying applies, to a lesser degree, to boards where that deck isn't possible or where only one player is building it. You could also make a case for leaving that out for brevity's sake, but as that specific situation is the only in-game example you give, you might achieve a bit more clarity by mentioning these concepts apply to decks that don't always draw themselves. 2: A picture of Wharf at the header. It's a small suggestion, and you even mention Wharf, but newer players sometimes take some time to see just why that card is as good as it is. I think this article helps with that. So yeah, what this article definitely needs is a "reality check" section that goes over the broader implications of what I make out as a narrow situation in the article. I still have to think about it more though. I don't think you lose anything in scope with your current example. It makes sense because it's an absolute, perfect example of the impact what you're talking about has on games and who wins them. I don't think you need a major re-write or anything, just a nod or a preface that you can apply the principles you're getting across to less extreme situations. Thank you everyone for your constructive feedback!